Galeodes sp., copyright Arthur Anker. The Solifugae, variously called sun spiders, camel spiders or wind scorpions, are fast-moving arachnids found primarily in arid environments. They have a body divided between the prosoma and a segmented opisthosoma, and have conspicuously large, chelate two-segmented chelicerae. Characters (from International Society of Arachnology): Body divided into two tagmata, the cephalothorax (prosoma) and abdomen (opisthosoma); appendages attached to prosoma. Dorsal plate of cephalothorax divided into propeltidium, mesopeltidium and metapeltidium. Abdomen segmented. Two eyes present, centrally located on dorsum of propeltidium. Chelicerae two-segmented, enormous, projecting forward from cephalothorax; male chelicerae bearing flagella or flagelliform setae. Pedipalps covered in sensory setae; cuticular lips present at tips of pedipalps that open to expose an eversible suctorial organ. Feeding via external digestion; sieve-like rostrum inside mouth opening filters out particulate material. Alimentary system consists of foregut, midgut and hindgut; hindgut bears lateral branches. Extensive tracheal system present that opens via prosomal and opisthosomal spiracles. Heart located dorsally in the abdomen. Brain consists of supra- and subesophageal ganglia. Malleoli (racquet organs) present as fan-like processes extending below ventral surface of last pair of legs. Female solifuge reproductive system includes pair of ovaries with pair of oviducts leading to a single genital chamber. Internal male reproductive system consists of two pairs of testes merging into vasa deferentia, which then merge into the genital chamber. [AP02] Alberti, G., & A. V. Peretti. 2002. Fine structure of male genital system and sperm in Solifugae does not support a sister-group relationship with Pseudoscorpiones (Arachnida). Journal of Arachnology 30 (2): 268–274. [BR05] Bouchet, P., J.-P. Rocroi, J. Frýda, B. Hausdorf, W. Ponder, Á. Valdés & A. Warén. 2005. Classification and nomenclator of gastropod families. Malacologia 47 (1–2): 1–397. [CS90] Corey, D. T., & I. J. Stout. 1990. Ground surface arachnids in sandhill communities of Florida. Journal of Arachnology 18: 167–172. [H02] Harvey, M. S. 2002. The neglected cousins: what do we know about the smaller arachnid orders? Journal of Arachnology 30 (2): 357–372. [KBT11] Klann, A. E., T. L. Bird & G. Talarico. 2011. Ultrastructural characterization of Hexisopus psammophilus (Arachnida: Solifugae: Hexisopodidae) spermatozoa in comparison to other solifuge spermatozoal traits. Journal of Arachnology 39 (2): 280–286. [R52] Roewer, C. F. 1952. Opilioniden and Solifugen aus Ost-Afrika. Veröffentlichungen aus dem Deutschen Kolonial- und Uebersee-Museum in Bremen, Reihe A 2: 87–89. [R54] Roewer, C. F. 1954. Spinnentiere aus El Salvador, I. 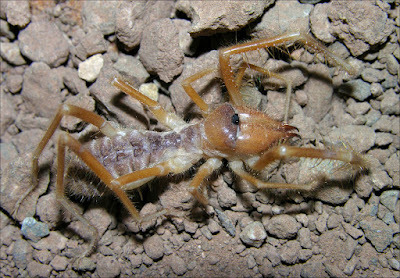 (Arachnoidea: Pedipalpi, Solifuga, Opiliones-Laniatores). Senckenbergiana Biologica 35: 57–73. [S69] Stoliczka, F. 1869. Contribution to the knowledge of Indian Arachnoidea. Journal of the Asiatic Society of Bengal 38 pt 2 (4): 201–251, pls 18–20. [W68] Wood, H. C., Jr. 1868. On the Phalangeae of the United States of America. Communications of the Essex Institute 6: 10–40.